Emma and Amelia Wright from Our Lady of Sorrows galloped on their pool float horses at Papa Palooza. The event included Irish- and Scripture-themed games and was held in advance of the World Meeting of Families in Ireland later in August. Rose Miller and Charlie Mohs tried to catch balls in baskets in a “Fishers of Men” game at Papa Palooza. The event included Irish- and Scripture-themed games and was held in advance of the World Meeting of Families in Ireland later in August. Families descended on the seminary grounds beginning around 2 p.m. for an afternoon filled with games, prizes, music and Mass to celebrate the upcoming World Meeting of Families next month in Dublin. In keeping with the Dublin event, the Palooza sported an Irish theme. “It brings (families) all together,” said Julie Bostick, director of the archdiocesan Office of Marriage and Family Life, who helped organize the event. 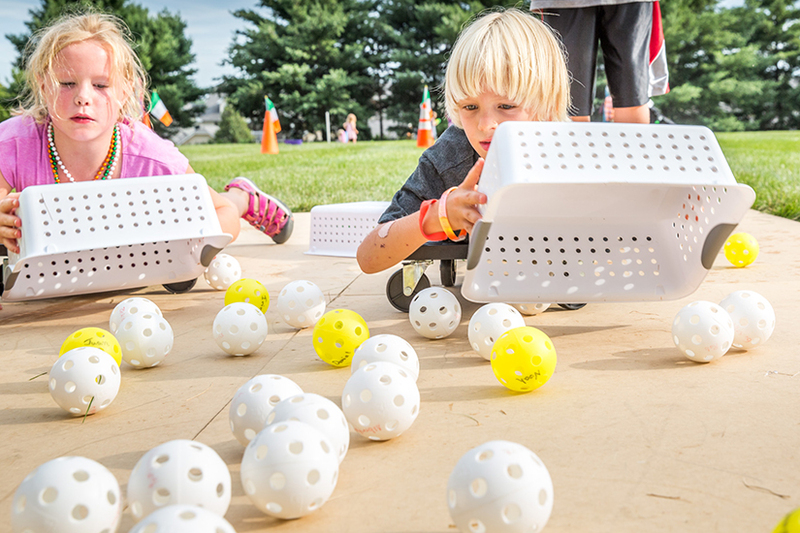 Papa Palooza began with games on the seminary’s field, including Plinko, life-sized Hungry-Hungry-Hippos (recast as “Fishers of Men”), a maze, musical chairs (dubbed “Shamrock Shuffle”) and an animatronic pig race (“Prodigal Son Relay”). In addition to the Scriptural twists to the names of many games, several activities included a catechetical component, such as prayers and fun facts scattered throughout the maze or trivia questions in Plinko. Competitors won raffle tickets which could be entered into a number of baskets with themes such as “Family Movie Night,” “Holy Land,” “Italy” and “Date Night.” Winners were drawn after dinner. Vicki Clayton said that the most enjoyable part of the day was “the games, having kids of all ages be able to enjoy the games.” Vicki and her husband Randall Clayton, of St. Richard Parish in Creve Coeur, attended with their seven children. “I really like the Irish theme, because I’m an Irish dancer,” laughed their daughter Anna Clayton. Games gave way to Mass at 4 p.m., and the rainy weather held off until all had gathered under the tent during the Introductory Rite. Auxiliary Bishop Mark Rivituso celebrated the Mass, preaching on the importance of family life rooted in faith. “As we celebrate faith, family and life, He is the one that we need,” Bishop Rivituso said in his homily. A dinner of sandwiches and pasta followed Mass, served under the tents as the rain let up almost entirely. Mealtime entertainment came in the form of music and dancing by St. Louis Irish Arts. After initial performances by the group’s members, children were invited to the stage and taught a progression of steps, performing for the crowd. The evening closed with a concert by Adam Wright and the Church Band; Wright is music director at Christ Prince of Peace Parish. Crowds continued to float around until after 7 p.m. 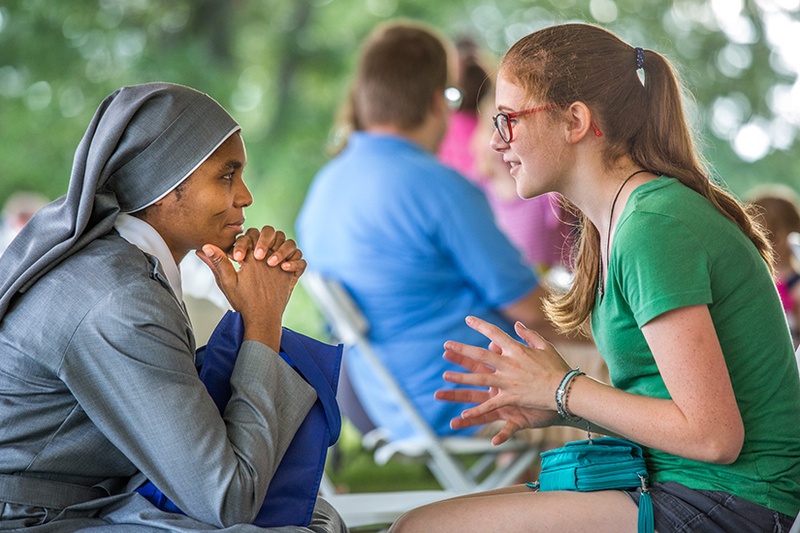 Sister Elizabeth Eziokwu, a Sister of St. Peter Claver, talked with Rachel Vrazel from St. Joseph Cottleville during Papa Palooza. Sister Elizabeth was explaining the mission of her order. But it wasn’t just families at the festivities. Seminarians and religious sisters roamed through the crowd, obvious in their Kenrick-Glennon shirts and habits, respectively. “A critical element of Papa Palooza is the seminarians being present to the children, and nuns in habits,” said Lori Anderson of Sacred Heart Parish in Troy. “Our children can (have) fellowship with those who serve in the cloth. That’s why I came back.” Anderson attended the event three years ago and returned this year with her daughter Hannah and granddaughter Lilli. Andrew Mason, whose parents and eight siblings attended with the Claytons, summed up the day.